With all of the dust and debris that can result from commuting day after day, drivers need a detailer that can restore their car's like-new shine. Every nook and cranny is inspected and cleaned by our professional team to ensure a cleaner, better looking car from every angle. One of the great things about living in Iowa is that our state is large, rural, and full of great outdoor experiences. While those things bring lots of tourists and politicians our way throughout the year, they also bring lots of dust and dirt our way. Our winters, too, are prime opportunities for vehicles to become dirtied and rather gunky during daily operation. To help combat the dust, debris, and dirt that characterize life in Iowa, our professional team of detailers can wash, wax, shampoo, and otherwise overhaul vehicles to give them a like-new shine. At Five Stars, we're committed to making sure that cars are clean both on the outside and inside the cabin. Many competing detailing locations focus solely on the car's exterior and, while it's always good to have a fresh wash and wax, it's simply not a good idea to ignore the car's interior materials. 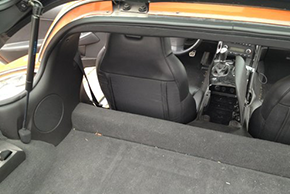 Our detailers shampoo the carpets inside the cars they work with, and they'll make sure that dashboards and car doors are kept free of dust and dirt. Cars will smell better, feel better, and look better, for all who are involved in the ride.